Brian's Taiwan: Happy Mid-Autumn festival! Today was the moon festival or mid-autumn festival. School and businesses are closed and everyone's out. It was a nice and warm sunny day today. The tradition is to BBQ outside. 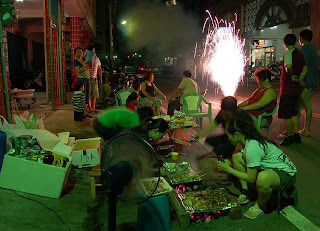 Despite the environmental concerns, alot of people were still huddled together with their family and friends grilling in the streets. The atmosphere was busy and full of laughter. The story of the mid-autumn festival varies, but in general it's the same elements. I'll attempt to tell it in a nutshell for anyone not familiar. A mortal man and woman lived on earth. The man was a skilled archer. At the time, there were 10 suns. The 10 suns scorched the earth, so the Emporer (Yao) order the man to shoot down all but one of the suns. The man did so, and his reward was two pills of immortality. One day his wife found the two pills and swallowed them. Two was too much so she became immortal and floated up to the moon. So now every year, on the eighth month and 15th day of the Lunar calender, when the moon is the fullest and closest to earth, we look up and search for the immortal woman on the moon. Thus explaining the moon cakes everyone eats at this time. I had my share of moon cake and more! Probably too many for my own health. But just for today, who cares! Om nom nom nom. LOL. I'll leave you with one new fact about me that I just discovered today. Tonight, looking through my photos of Miaoli and my family's shrine with my father's sister, we noticed my grandfather's name on the wrong side. If you take a look at the picture, there are two engraved plates. The one on the left is Huang and the one on the right is Lee. My grandfather was listed under Lee. Apparently during the japanese rule, our last name was misfiled or mislabeled as Huang. So my last name is really Lee. Shocking! It's not everyday you learn you have an alternative last name. Brian Lee...? Ah, that's what people do in Taiwan during moon festival! 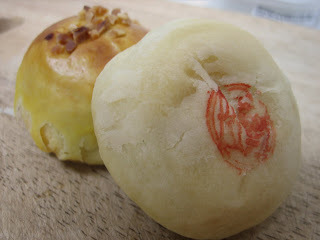 I was totally off with lantern :) Those are some new variety of moon cakes! How do they taste? Taiwanese fly sky lanterns too. But I definitly saw more grilling. I'm sure there are alot of flavors, but I only saw jujube, orange, meat, red bean, lotus seed. I like the skin on these better. Less doughy and more flaky like a pastery. Yup, thats what i've been told. Xiao Ah-Gong's name is on the Lee side. Picture proves it. I wonder if mom and dad know anything about this, and why they didn't tell us sooner?? ?